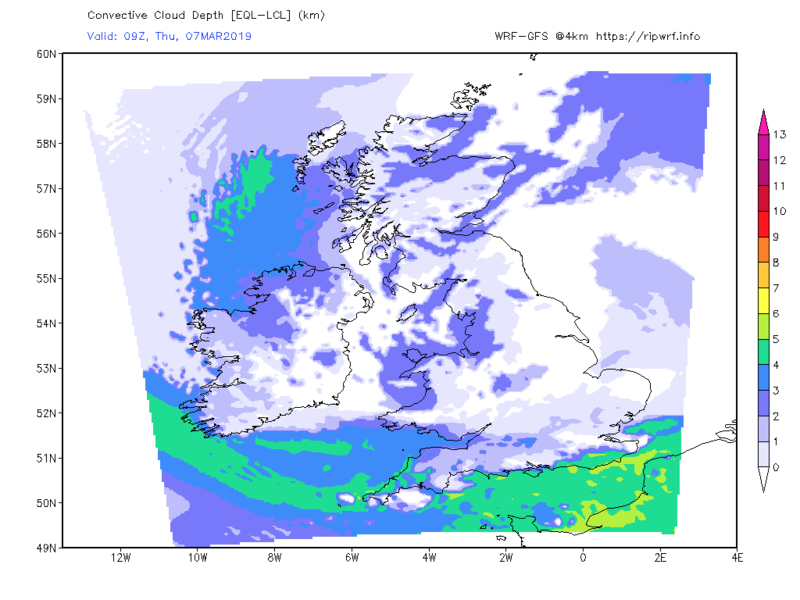 After a wet showery day Wed, no rain since midnight, patchy cloud and a low of 5.6 C; rainfall yesterday was 21.2 mm the wettest day I think since one in September last year. Further showers yesterday evening, some of them briefly heavy. Some clear spells developed after midnight and it was dry well before dawn. Cloudy and windy with a few spots of rain at the moment. Further moderate showers last evening, these clearing away after midnight. Bright and sunny spells, cloud increasing this morning. Maximum temperature to 18:00 GMT yesterday 12.6c. Minimum temperature on grass 1.6c. Barometer 981.8mb Trend rising slowly. Light to moderate rain continued last evening until after midnight and in to the early hours. overcast this morning, odd spot of rain.. A few sunny spells, though showers breaking out, these turning heavy by afternoon. A cloudy day with continuous light-moderate rain from around 0900 onwards. A windy day with sunny spells and occasional showers. Maximum 11.3, minimum 5.4. Wind fresh W.